The twisted inner workings of a Deaf person's mind. Forever gone are the days of phone booths and having to actually go and see the person you want to contact, because there’s no way for you to reach them. Here instead are such things as cell phones, video relay centers, and vibrating alarms. And, to make things even more bewildering. As fast as you can learn how to use these things, there will be updates and even newer technology to deal with. Don’t get me wrong—I love technology. I mean, having a way to contact people while I’m out and about is an unbelievable relief. As with most deaf people, there was a time when flat tires and car accidents left us stranded with no where to turn. Although there’s tons of things to help the deaf and hard of hearing get through life now (doorbell signalers, door knock flashers, baby cry alerts, vibrating alarm clocks, flashing fire alarms and more), one thing seems to have changed the most for us: using the phone. Years ago, TTYs and TDDs were the way to contact people directly. If the other person didn’t have a TTY or TDD, for example, if they were hearing, the deaf and hard of hearing would call the relay center to help with the contact. We’d type. Then the center would read what we typed to the other person. They’d respond and the center would then type to us what was being said. It was great for what it was, and some people and companies do still use them, but at times it could be terribly slow and quite impersonal. Now, text cell phones do the trick, but there’s been one improvement many people rate as top notch—the ability to use Sign Language to communicate over the phone. I’m serious! How? 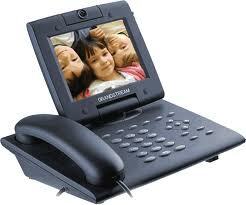 Video Phones (VP), computers, and even some cell phones now offer that capability. If two people have VPs, they can simply dial directly and have a nice “face to face” conversation with each other. This can also be done through computer instant messaging programs, other computer programs such as Skype, and even your cell phone. But now, thanks to Video Relay Services (VRS), if only the deaf or hard of hearing have VPs and they need to reach someone who doesn’t, they can still use Sign Language and call on a home-based phone line. It works in much the same way as TTY Relay Centers work. The deaf person dials the phone number for whomever he or she is calling and is immediately connected with some an interpreter at the VRS. The interpreter there then signs with the deaf person “face to face.” VRS connects the deaf to the target person, the deaf person signs or uses his voice (whichever he’s more comfortable with), the ‘terp tells the other person what was signed (if the deaf person isn’t using Voice Carry Over—VCO), the other person responds in their regular phone and the ‘terp signs to the deaf what was said. Confusing” Maybe at first, but once you’ve done it a few times it’s pretty much a godsend. So, technology really has come a long way for deaf and hard of hearing people. I, for one, am excited to see what comes next! I like tech! Smart phones help those of us with add and short memories. I had just recently gotten one of those free Closed Captioning phones. It is really cool how the words show up on the screen. Do you have a phone like that? Random House Webster's Compact ASL Dictionary by Elaine Costello Ph.D.
MICHELE HAS TWO OTHER GREAT SITES!